When submitting a QSO to LoTW, you must present a Callsign Certificate that matches the station callsign you used over the air when making the QSO. Thus if you've made QSOs using callsigns other than your present primary callsign, you'll need to request a Callsign Certificate for each. This process is more straightforward and rapid than requesting your Initial Callsign Certificate because your initial certificate is used to authenticate your request. If you've already requested a Callsign Certificate for a callsign but have not yet received a response, don't initiate another request; doing so will invalidate the Callsign Certificate you requested, which may be in process or in transit. If you're concerned with the delay in receiving a response to your Callsign Certificate request, send email to LoTW-help@arrl.org . When you direct TQSL to request a Callsign Certificate, it generates a public key and private key pair, sends the public key and your callsign to the ARRL, and saves the private key on your computer. LoTW responds by combining your callsign and public key into a Callsign Certificate that it sends you via email. A Callsign Certificate can only be used to submit QSOs if the associated private key is present on your computer, so you should accept a Callsign Certificate using the same computer with which you requested it. 1. Start TQSL and select the Callsign Certificates tab, which displays a list of your Callsign Certificates. 2. 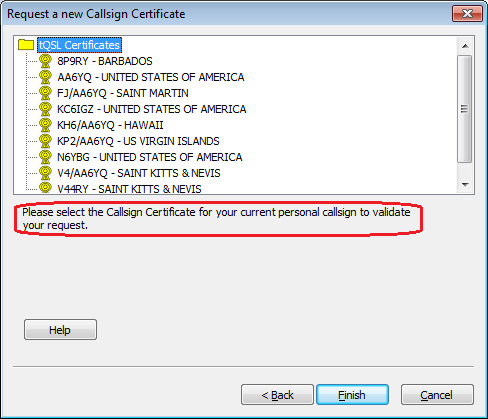 Open TQSL's Callsign Certificate menu and select the Request New Callsign Certificate... command; the Request a New Callsign Certificate dialog will appear. * If you've already requested a Callsign Certificate for the station callsign you specify, TQSL will not permit you to proceed: you should wait until you receive an email message from the ARRL bearing the Callsign Certificate you've already requested. If you are certain that your earlier request was lost or invalidated, select the Callsign Certificates tab, right-click the entry for the pending Callsign Certificate request, and select the Delete Callsign Certificate command; after you delete the pending Callsign Certificate request, you'll be permitted to request a Callsign Certificate for the specified station callsign. 3.e.1. If you're using a shared computer, you should protect your Callsign Certificate by entering the same password in both textboxes; you'll be asked to provide this password each time you direct TQSL to digitally sign a log file. If you control access to the computer you're using, you can leave both textboxes empty, thereby avoiding the need to provide a password each time you direct TQSL to digitally sign a log file. 3.g.1. you will be prompted to save a file whose name is the callsign and whose extension is .tq5; save this file in the folder you created previously. 3.h The Callsign Certificates tab will now show an entry for your certificate with a pending icon: (because the Callsign Certificate doesn't actually yet exist, and thus is not functional). 3.i You can close TQSL by opening its File menu and selecting the Exit command (on OS X, by selecting the Application menu's Quit tqsl command). 4. If you did not upload the certificate request to LoTW in step 3.g, upload your certificate request file to the ARRL via https://lotw.arrl.org/lotwuser/upload; use the Browse or Choose File button to navigate to the folder you created previously and select the YourCallsign.tq5 file you find there. 5.a Above your address on the front of the postcard, you will find your 8-character Validation Code. If you submitted a request for a Callsign Certificate for a callsign for which you already hold a Callsign Certificate, LoTW staff will contact you via email to determine your intentions. Note: Obtaining a Callsign Certificate for a callsign in certain DXCC entities also requires submission of a Landing Permit and/or Proof of Entry. If you do not receive an email message bearing your Callsign Certificate after 3 business days, do not submit another Callsign Certificate request; instead, send an email message to LoTW-help@arrl.org inquiring about the delayed response. © 2019 American Radio Relay League, Inc.